Aramark has helped more than 300 organizations revamp their dining programs, while efficiently operating healthcare facilities to improve patient care. By incorporating innovative dining options and effective integrated facilities management, staff, visitors and patients satisfaction ratings are sure to increase. 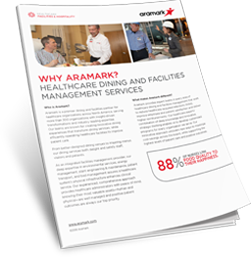 Discover how Aramark is helping healthcare facilities across the country in this all-encompassing guide.